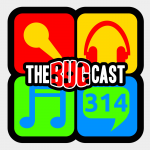 This week on The Bugcast: the kids try and take over after a sugar injection which quickly deteriorates into hysteria. Plus, we play 8 fantastic tracks of independent and Creative Commons music! The next live show will be episode 315, which will be broadcast live in the chatroom on Friday 30 May 2014 from 21:00 (ish) UK time (UTC+1/BST).